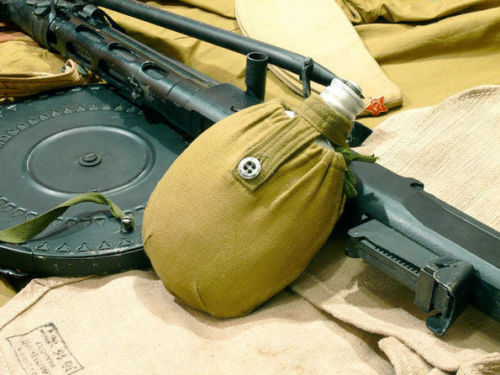 Army canteen with cover - designed for storing and carrying any liquids. Made from thick and durable aluminum food. Great for hiking, hunting or fishing. Classic Army flask volume of 0.75 liters made of high quality aluminum. The advantages of this material can not be overestimated: it does not rust, can withstand tremendous heat, the liquid does not give an unpleasant metallic taste. Furthermore, the surface of aluminum flasks after firing becomes sterile, which prevents the growth of bacteria. 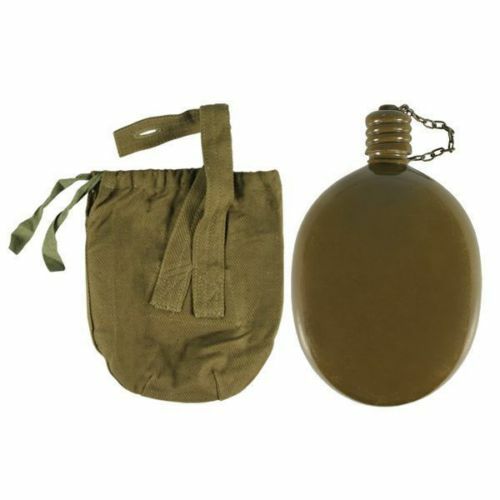 Army flask round shape evenly distributes the load, so it is convenient to take with you on long hikes. The outer surface of the jar is painted sverhstoykoy painted khaki. Flask equipped with a convenient screw cap on a chain, which excludes the possibility of its loss. 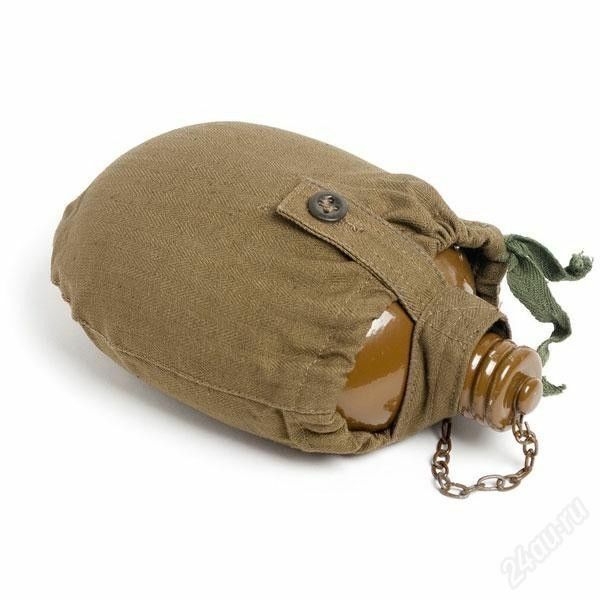 Army flask packaged in a pouch functional Imbued khaki, equipped with a handle for attachment to your belt. Cover the jar allows little to cool its contents - it is enough just to moisten the cloth with water. Army Soviet times jar is made of aluminum safety for food . Form jar - oval , curved , allowing convenient to keep a jar in hand. Jar painted in green (field , shielding ) color. Also, there are not painted jar. Closed flask using the screw cap with rubberized gasket to seal . To avoid losses, the lid is attached to the flask using a chain. 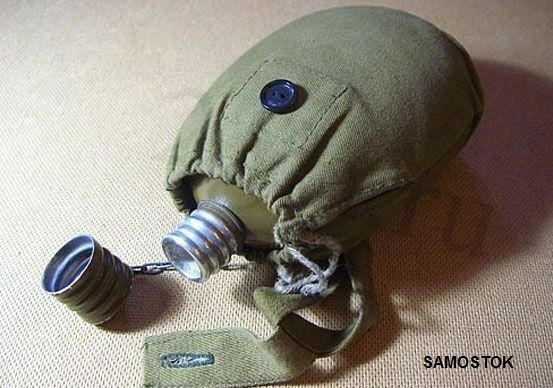 Flask placed in a canvas bag (usually olive green ) . Case is attached to the belt by means of classic fixtures. Army jar is a proven and highly reliable companion in any hike ! This product is very valuable find for collectors and lovers of antiquity, as it is very rare. This thing is kept in perfect shape stock Soviet army, was not used, may have small scratches, as it has aged more than 28 years. Good for camping, hunting and fishing. Case also serves as a thermos (keeps warm or cool the contents of the flask ) . 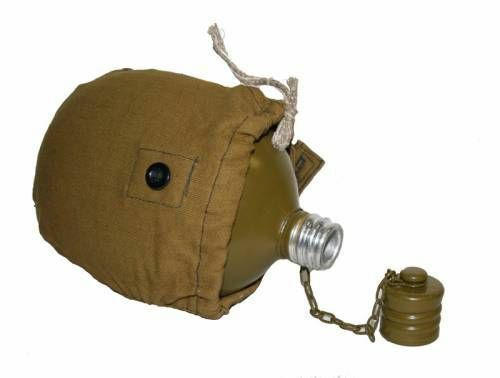 Flask new, unused, was stored at the warehouses of the Soviet/Russian Army.